SeaWorld’s oldest coaster has been closed for two months. The park got virtual reality equipment installed, and reopened last Friday as the first major Florida theme park with a virtual reality plug-in. Riders can choose whether to use the virtual reality headset attached to the safety harness. In fact, they are on the same rail that has been installed since the ride opened for the first time 17 years ago. Guests must affix and adjust the headsets. The units are sanitized after each use by members of the Kraken crew. 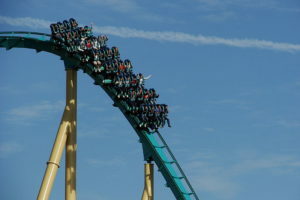 The film is synchronized with the movement of the ride. The coaster is 4,177 feet long and stands 153 feet tall. It still turns upside-down seven times with a top speed of 65 mph. Friday also marked another debut at SeaWorld’s theme park- Spot Saver system. The system allows guests to reserve ride times on the new coaster. Spot Saver will be free of charge it is aiming to minimize the wait at the loading station — while adjusting and cleaning is happening. The new Kraken seats four people per row. SeaWorld also owns Busch Gardens in Tampa. The company is considering adding the technology to more parks.